Mum got this stitched dish towel from Gram for Christmas. Of course my eyes lit up. And lo and behold, it made its way into my suitcase! I'm just borrowing it, honest. Uh, maybe. Those of you who like to embroider, have you visited Vintage Transfer Finds yet? Its a collection of old-fashioned embroidery stitching patterns. Run on over there! For more useful links and instructions on how to transfer the patterns to your fabric, click here. "Borrowing"??? Sooooo... I get it back after it's worn out? Well, I wasn't really going to give it back anyway. Ha! thanks so much for the link! i just started cross stiching and have been searching to find cute patterns to try, this is a tremendous help! I just stopped to say that I love your blog! And you are such an inspiration to me, ::struggling graphic design student:: that one day I can be doing what I love to do!! It was made for you! Excuse me, could you and your mother stop using this forum as you own personal chat room? Okay, I'm just jealous because my mother never comments. How cute! You always have the most interesting things on your blog. Love to read it. I love the conversation her between you and your Mom! My Grandma Ofelia used to make these all the time. She even sewed her own dish towels. When I got married 7 years ago, she gave me a set; Monday, Tuesday, etc. Except, she lost of the days. Oh, well. Grandma O passed away over 2 years ago. I'm glad someone is keeping this craft alive. Thanks for pointing out the site. and again something fabulous! thank you for sharing. That's hard to be so far away! Look what my mom says on the next post. What a nut. OMG, your mom is super funny! Guess you could never stop laughing while growing up! Nice! Cannot hug my mom. So, a big hug to yours! 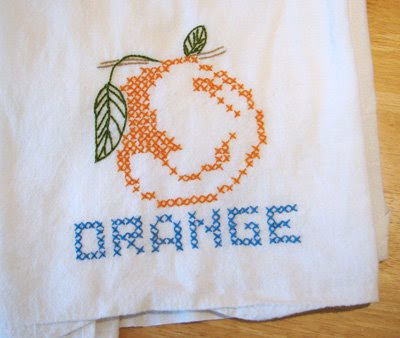 That is the best dish towel ever! Totally worth stealing - er - borrowing. Love the embroidery! I also love your site. Always fun, always refreshing. I bought this today on etsy.com: http://www.etsy.com/view_listing.php?ref=fp_feat_10&listing_id=14947648. I thought about you and your love of orange, when I saw it. Ha! Busted... I love that your mom is reading this. So brilliant. I tried to hand embroider once but I am not quite... um... neat... enough. My patience may have something to do with it also. Maybe. Perhaps. That is excellent. Enough to make me think about embroidering, which I've not done before. Ohmigoodness, thanks for sharing the Vintage finds link! It took me back to ironing all of my grandmothers linens & pillowcases...because it was my favorite thing to do of course. I can't wait to find a project for them.